Lyon Street in downtown Albany on Wednesday. It was actually the right lane that was closed at the time. 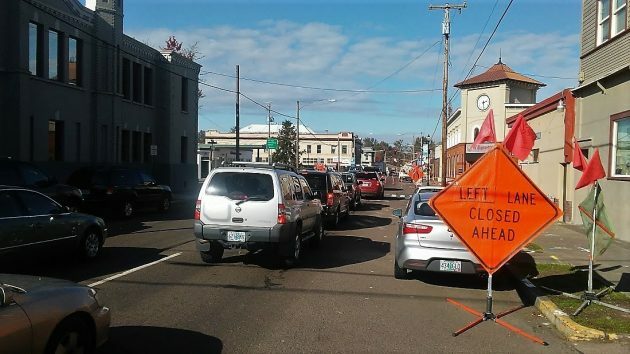 Lane closures that caused unusual traffic slowdowns on Albany’s downtown Highway 20 couplet Wednesday should be a thing of the past, for this year anyway. When Ellsworth Street was restricted to one lane during part of the day Wednesday, traffic heading for Albany on Highway 20 was backed up as far as Scenic Drive at one point, according to someone who called City Hall. Trips to town from North Albany that normally take 10 minutes took twice that long instead. The lane restrictions had been timed for after the morning rush hour, but the volume of traffic didn’t seem to diminish as expected, according to what city spokeswoman Marilyn Smith told me. What caused it all was that the contractor working on Albany’s downtown streetscape renovation project was removing steel plates covering excavations on Lyon and Ellsworth streets (the two legs of Highway 20) and repairing the gaps in the pavement with hot-mix asphalt. This could not be done at night because the hot mix could be delivered only during the day, Smith told me. 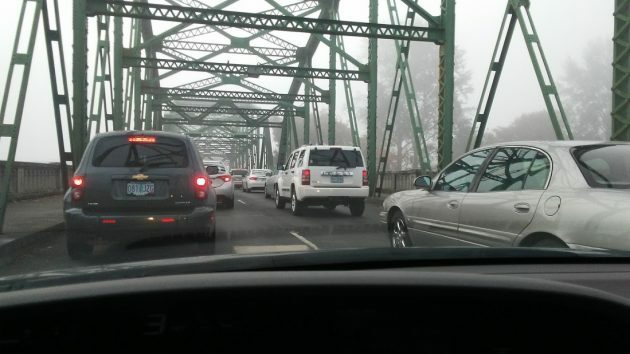 Traffic was stop-and-go on the Ellsworth Street bridge just before 9:30 a.m. on Wednesday. Many of those who were affected by the traffic knot are citizens of Albany’s Ward One. As these fine folks fumed in their cars, stopped dead on the bridge into downtown, they began calling their City Council representative. But when they reached the Sykes number they were greeted by the following message. “This call may be monitored. Councilor Sykes is on vacation and is unable to be of any help in your current dilemma. He is scheduled to return sometime. In the meantime, if you still have concerns, please call Guest Councilor Pierson. If your complaint aligns with the goals of the Albany Chamber of Commercialization, some attention may be given to it. Please remember that the Guest Councilor does not have a real vote. He is there to make certain the Chamber’s agenda is moving ahead. In that sense, his vote is the only one that matters.